Located on S Egg Harbor Rd just off S White Horse Pike, Extra Space Storage serves residents of Hammonton. Locals will recognize our facility across from Sunoco Gas Station. 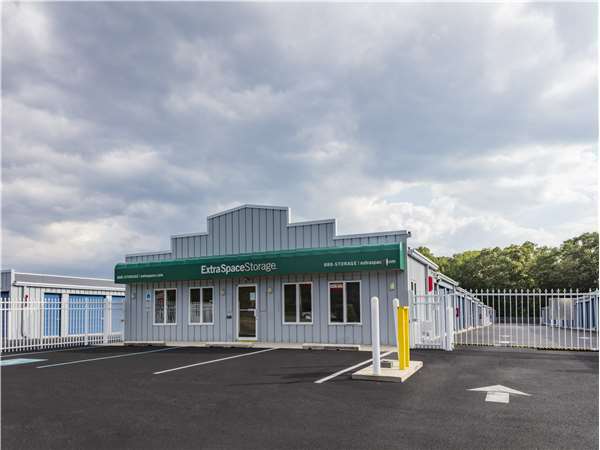 With a large selection of storage units, climate-controlled storage, vehicle storage, and exceptional security, Extra Space Storage on S Egg Harbor Rd is your ideal storage partner in Hammonton! Our Hammonton storage facility can handle residential and commercial storage needs! Units range from 5x5 to 20x20 and include convenient features like indoor access, drive-up access, and first-floor access. Extra Space Storage cares about your safety! That's why we utilize security features like 24-hour video surveillance, electronic gate access, and an on-site manager at our S Egg Harbor Rd location. Climate-controlled units keep your temperature-sensitive items safe by maintaining a storage environment between 55 and 80° at all times. These units are available in sizes 5x5 to 10x20, and some even include drive-up access for added convenience. It's easy to find secure vehicle storage in Hammonton with Extra Space Storage! Our 10x20 to 10x30 outdoor parking spaces and 10x10 to 20x20 enclosed drive-up units can handle cars, motorcycles, boats, and RVs. At Extra Space Storage, we're committed to providing high-quality self storage and excellent customer service! Our friendly, professional staff ensures our facility is clean, secure, and well-maintained at all times, and they truly care about delivering a positive, memorable experience for each and every customer. Contact us today to reserve a storage unit in Hammonton! Facility is well lit and clean. The staff is outstanding and extremely helpful. I would recommend you store your goods here. The prices here are phenomenal. The staff was beyond courteous and willing to make any necessary adjustments we needed to ensure our comfortability with the whole process. Great option for our needs. Awesome customer service!! Very clean units!! Great service ! Jo was very helpful and knowledgeable. I would definitely refer family and friends . Great service. Best price in the area for what I needed. Very helpful associate named Jo was a tremendous help, especially since I never used a storage facility before. She was knowledgeable, patient and very thorough. I rented at the Hammonton NJ location. The manager was knowledgeable, friendly and completely willing to assist. The unit was as clean as clean can be. It was easy to access, secure and I do not have a bad word to say! Impressed by office people, how well-maintained the place is, location perfect. Their customer service went out of their way to make the process easy. Highly recommend this location. They have great prices and the customer services was excellent. Very clean! Quick and easy process to sign up for storage. The facility is clean and staff are friendly. Customer service experience was great. Hard to find decent customer service anymore, so this was refreshing. Units generally clean, easy to access (large trucks can move fairly easily around the complex), secure and well lit. I drive past the facility at least 3 times a day so when the need for storage arose I knew where to go didn't even check other places. I had an excellent experience here. I was greeted, shown different sized storage facilities and given exceptional personalized service. Highly recommended. Electric outlet by storage rental. And lights come on automatically when door is open. Office people are awesome. It would be great if it was open later at night or 24 hrs. I was very happy with the price. I like the fact that the units have high ceilings. I've stored at other places and this is the best by far. Extra Space Storage in Hammonton, on the corner of Egg Harbor and White Horse Pike, is convenient and comfortable. I spend a bit of time every week, sorting through the stuff I keep there. A motion-activated light comes on automatically in the unit, when I lift the garage door. I can use the clean rest room in the office. There's always someone around to answer questions or lend a hand. I LOVE not having a junked up home, because I can store my business stuff where it is safe and dry - and I'm not tripping over it. I've had stuff in storage all across the country. This is one of the nicest facilities I've ever rented space in. I also like being able to buy boxes, tape, and packing materials right on site. And the price is right, both for the boxes and for the storage unit. I have two storage units at ExtraSpace in Hammonton, NJ and I'm keeping them. I got the best deal around. The place is clean. I've been getting things in and out of storage frequently and whenever I'm on site, the property is well maintained. No problems at all. When my inventory is low, it would be easy to relocate. But I'm planning on staying here, with a good deal. Comparing prices and facilities, I got the best deal at ExtraSpace Storage in Hammonton, on Egg Harbor Rd., close to White Horse Pike. The units are well swept, relatively new, and completely dry. The whole place is clean, the facility is secure, with good lighting. Restrooms on premises. You can buy boxes, tape, padlocks, even wardrobe boxes, there. Staff are consistently friendly and helpful. I have been very happy doing business with ExtraSpace Storage. S. Egg Harbor Rd. and 8th St. Landmarks: Sunco Gas Station. Drive south on S White Horse Pike. Take a slight right onto Weymouth Rd and continue straight. Turn left onto S Egg Harbor Rd. Our facility will be immediately on your right. Drive north on Weymouth Rd. Turn right onto S Egg Harbor Rd. Our facility will be immediately on your right. Drive northwest on S White Horse Pike. Take a slight left and continue onto S Egg Harbor Rd. Our facility will be on your left across from Sunoco Gas Station. Drive southeast on S Egg Harbor Rd. Our facility will be on your right just after 8th St.